"Adobe Youth Voices has not only given me a voice but also the skills, confidence, friendships, new experiences and a chance to change my environment. I can comfortably work with majority of Adobe’s software; I have confidence in all my projects and my message because I know that every message is worth the attention." The digital revolution has created spaces for young people to spread their messages on a global scale. Through youth media making, young people claim the power to create and distribute their ideas. They are able to participate in democratic information sharing processes that allow youth to be heard and young people’s creative confidence to emerge in an effort to respond to worlds most challenging issues. At TakingITGlobal, we are committed to providing meaningful spaces for youth media artwork to exhibited. 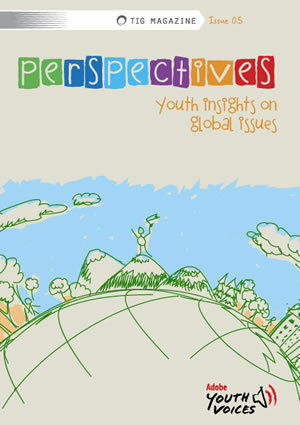 Recently we launched Perspectives: Youth Creating Change on the TakingITGlobal Global Gallery, featuring over 100 multimedia pieces submitted by our participating youth artists. We have showcased participants’ artwork at several international conferences and events such as; UNESCO Youth Forum, Youth Assembly at the United Nations, Global Youth Assembly, OCIC Global Citizens forum and many more. We believe that when young people’s artwork is showcased at high-profile events the impact that is created is meaningful, therefore increasing the youth’s creative confidence and their ability to create positive change in the world!